New treatments deserve new effective methods of detection. The Reichert Foresee PHP provides an unsurpassed level of sensitivity and specificity in detecting recent onset Wet AMD. Revolutionize the way you manage your AMD patients and ensure that treatment is begun as early as possible. The Foresee PHP Preferential Hyperacuity Perimeter provides an unsurpassed level of sensitivity and specificity in detecting recent onset Choroidal Neovascularization (CNV) and differentiating it from the intermediate (dry) state of AMD. 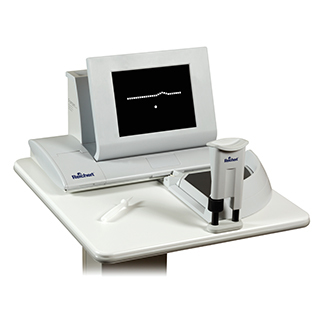 The visual field analyzer monitors macular function by measuring relative photoreceptor field location and utilizing the phenomenon of hyperacuity, the ability to detect the misalignment of an object's location relative to the other objects in space. By combining the patient interactive software with the innovative algorithm, PHP technology can identify CNV lesions when they are small and when visual symptoms are still unnoticed. Early detection remains the vital precursor to preserving vision and maximizing treatment outcomes. The earlier the detection, the earlier the treatment, and better the visual outcome. The Foresee PHP Technology is based on the well-studied phenomenon of hyperacuity. Hyperacuity, also known as Vernier acuity, is the ability to detect misalignment of an object's location relative to other objects in space. This ability to detect misalignments is in the magnitude of 3-6 seconds of arc, which is 10 times better than the resolution ability in the fovea (around 30-60 seconds of arc). Hyperacuity is unaffected by a patient's age and is highly resistant to retinal image degradation, and is thus suitable for assessing retinal function in patients with cataracts as well. Full macular testing of central 14 degrees, automated analysis, and visual field mapping. Easy to interpret results with the only normative database available for AMD patients. Higher specificity and sensitivity than current methods for detecting early. Reduces the number of early and late referrals and allows for timely and effective treatment. Diagnostic capabilities based on the hyperacuity (Vernier) phenomenon. Hyperacuity has a higher sensitivity than normal visual acuity and is unaffected by patient age or physical condition. PHP technology reveals distortions otherwise hidden by the brain's innate ability to fill in scotomas and overcomes inherent problems associated with the Amsler Grid; completion, fixation, crowding and compliance. Fast, easy and intuitive testing for patients and technicians. Data Storage: Data results stored on a 40GB hard drive. Dedicated USB memory stick for automatic results backup. Removable USB memory stick for results export and software upgrades. Increase patient awareness of Age-related Macular Degeneration and Foresee PHP testing with colorful, informative patient brochures.